Trump Officials Struggle To Meet Deadlines Even As More Migrant Families Reunited Two Central American fathers in El Paso were just released from ICE custody and reunited with their toddlers. Attorneys say the reunification process is ongoing, but haphazard and poorly coordinated. 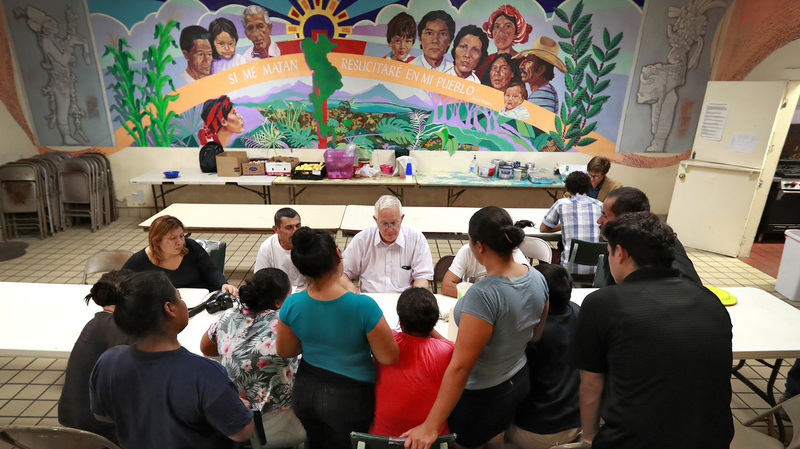 Ruben Garcia (center), director of the Annunciation House, speaks with migrant parents on June 26, 2018, in El Paso, Texas. On Thursday morning, two days after a court-imposed deadline, the Trump administration announced it had completed the first phase of reuniting immigrant families separated by its zero tolerance policy at the U.S.-Mexico border. In a joint statement by the departments of Justice, Homeland Security, and Health and Human Services, government officials said they worked tirelessly to reunite 57 children under age five with their families. This represents more than half of 100 or so children included in a lawsuit brought against the administration by the American Civil Liberties Union. Another 46 cases, including kids whose parents were already deported, have yet to be resolved. Ruben Garcia is the director of the Annunciation House, a migrant shelter in El Paso. It is one among many community organizations nationwide assisting with reunification efforts. Garcia witnessed the government's last-minute hustle up close. Hours before the deadline expired on Tuesday, he got a call from Immigration and Customs Enforcement asking whether he could receive three Central American fathers who had just been reunited with their toddlers. "They wanted it done and they got it done very fast," Garcia said. "That shows me that when they want to move on this, they can." In these cases, Garcia said authorities didn't bother placing ankle bracelets on fathers before their release and waived DNA testing, which had delayed previous reunification efforts. Earlier that same day, a federal judge in San Diego told government lawyers that lengthy screening procedures weren't appropriate with regard to most of the ongoing reunification efforts. Instead, the judge ordered the government to move more quickly. That's one reason Roger Andino of Honduras was able to hug his toddler for the first time in five months. According to Andino, the pair had requested asylum legally at a port of entry in February and were soon were separated— something U.S. Customs and Border Protection has said rarely happens. Andino was then held at a south Texas detention center, where he said he threatened suicide to pressure authorities into allowing him regular phone calls with his son. On Wednesday, Andino held his 3-year-old in his lap while he talked to reporters at a shelter run by Annunciation House. "Seeing my son again was marvelous," he said. "I was overcome with happiness and peace." Now Andino is traveling to meet other relatives in the U.S. He must check-in with immigration officers while his asylum case moves through court. Meanwhile, officials continue to work rapidly to reunite other families. Garcia of the Annunciation House said it's a vast improvement from the government's previous efforts. "I'm asking [that the government] extend that same spirit of urgency to the 2,500 children that are still separated and get it done," he said. But on a call with reporters earlier on Thursday, Chris Meekins with the Health and Human Services Department stressed that, when it comes to releasing children, his agency must continue to follow its strict protocols, including DNA testing. "Each step of our process is necessary to protect children, eliminating any one of these steps will endanger children," Meekins said. An HHS spokesman later clarified in an email that while the agency strongly believes in its vetting procedures, it will truncate the process in order to speed up reunifications of immigrant children ages 5 to 17. The deadline to reunite those more than 2,000 kids is two weeks from Thursday. The government is still working to resolve 46 cases of kids younger than five. They include those whose relatives have already been deported. They also include cases where the adult claiming the child has a criminal record. Government officials said other adults admitted they weren't the parents of the kids they claimed. One allegedly had a false birth certificate. Another reportedly has a "communicable disease." These are the kids that continue to concern Lee Gelernt, the ACLU attorney who's leading the court challenge against the administration's family separation policy. "The government is supposed to be giving us specific information about each individual they are not going to reunify so we can follow up," he said. "Let me be clear, some of those individuals will have the right to be reunited, just not by the deadline." Gelernt said he was happy for the families now reunited, but that it didn't excuse the government for missing the July 10 deadline. He said the ACLU is likely to seek penalties against the government at a court hearing scheduled on Friday.